Graduation is a major life transition for young adults who are ready to take on the world. When choosing a gift, think about this new chapter of their life and how your gift can help make their life a little easier. Personalized gifts are also great for grads who are looking to add their own touch to a new home. Here are our favorite college grad gifts. 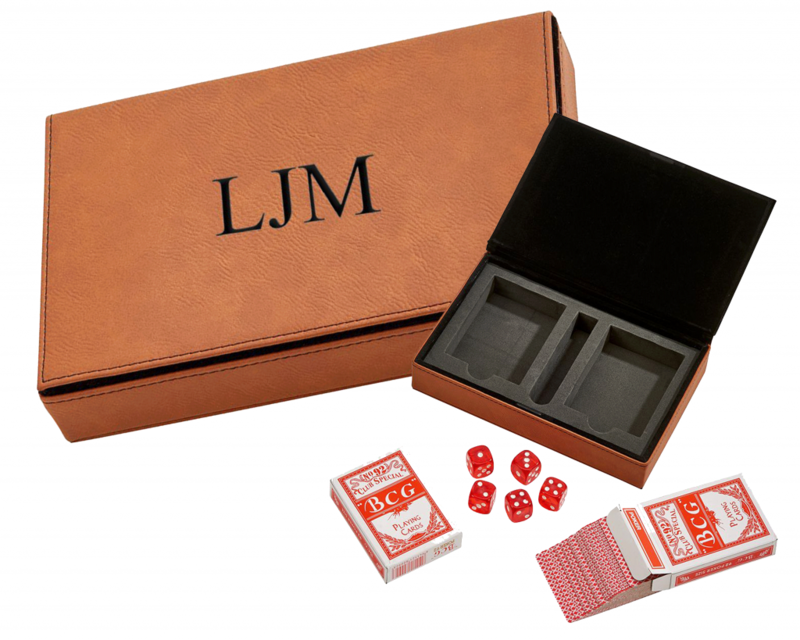 The Leatherette 2 Card Deck Set is great for grads who are moving into an apartment with roommates or for someone who likes to entertain. The leatherette top can be laser engraved with the engraving showing up as black. Are you passing down a family heirloom or did your grad receive a pin during graduation? 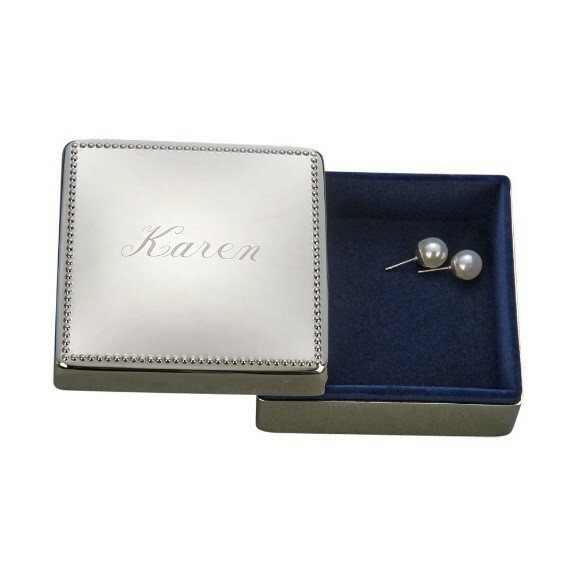 This charming 3.25” square box is a great piece to add to any jewelry collection to keep those cherished items safe. It has a lift off lid with beaded edging and is lined in a dark blue flocked cloth. Add some personal touches to your mantel piece with this wood arch clock in piano finish. 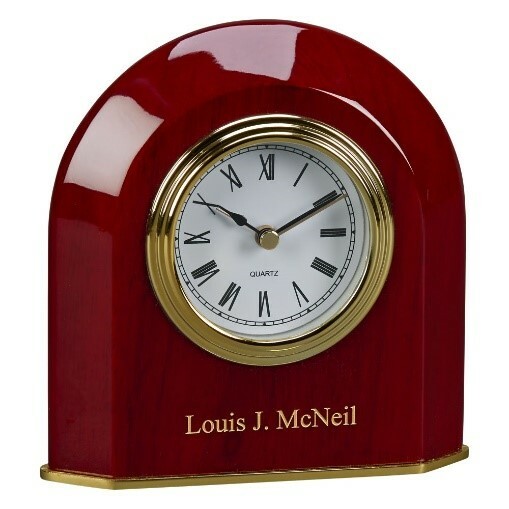 The area under the gold accented clock face has room for engraving with a graduation date, name or special quote. This entry was posted in graduation, Personalization, Special Events, Uncategorized on April 22, 2019 by Creative Gifts. Is a wee little one about to enter your family? Celebrating with the mom-to-be can be so much fun! As the big day approaches hopefully family, friends, and maybe even co-workers will host a baby shower to help the new parents get ready to welcome their little bundle of joy. From diapers, to onesies, to keepsake items, they will need it all. If you are looking for something personal and unique, check out some of our specially designed baby gifts that will be cherished for years to come. Some of our more popular items for baby showers are the adorable banks we offer. They come in so many fun styles including Noah’s Ark, a kitty, teddy bears, a puppy, elephants, trucks of all kinds, and, of course, the traditional piggy bank. There are a wide variety of looks to choose from such as brushed pewter, ceramic, or silver. As always, our keepsakes can be personalized with the name of the child, his/her birthday, or a monogram. You may even want to start the newborn off with something to fill the bank! Babies mean that there are many milestones to come in the weeks, months, and years ahead. The first smile, first word, and first steps are among some of the much-anticipated landmark moments. In addition to these moments are the loss of the first tooth and the first hair cut. Our personalized Baby First Curl and Tooth Silver Box Set is a traditional keepsake gift featuring a raised Teddy with “My First Curl and My First Tooth.” The years will pass by quickly but items like this can be held onto forever. Baby’s first photo will be a cherished item for years to come. Celebrate this moment with a “Hinged Baby Frame and Engraved Message” to the new little one. Include a short message, quote, or maybe even the baby’s name and date of birth. While there are many picture frames to choose from, this particular one has an adorable teddy bear and hooks that allow the piece to be hung on a wall as well. Creative Gifts Direct has a huge assortment of gifts that can be personalized for many different occasions. Check out our website and search by event, product, or recipient. Happy shopping! This entry was posted in Uncategorized on March 5, 2019 by Creative Gifts. “Will You Be My Valentine?” Isn’t this the phrase we all want to hear around February 14th from our sweethearts? Saying the words are special, but showing you care in thoughts, words, and actions is even more important. Do something for your Valentine to show them you care like taking on a chore they dread, planning a night of fun and relaxation or just being there for your loved one. Love can be shown in so many millions of ways, so find something that is meaningful to your special someone. Then, consider commemorating the day with a personalized gift that will remind them of how much you love them all year long. Here are a few ideas. Are you a traditionalist? Then this heart-shaped necklace is just the right gift for your Valentine. Both sides of the heart allow for optional personalization, such as a name on either side or a short message like “My Love” or perhaps the date when you first met. Find something that is perfect for your relationship. She will love it and cherish it for years to come. This beautiful jewelry box is a perfect gift to hold all her special pieces and a perfect place to keep an engagement ring for safekeeping. The cover is hinged and has a beaded design along the cover edges. The cover and box are lined with a dark blue flocked cloth. Have a name, a date or a short phrase engraved so it is even more personal. For the man who loves to go out in style and could use a reminder of the time, this brushed stainless steel finished Pocket Watch with chain is a perfect choice. The lid opens with the push of a button to reveal the clear black numbers and can be engraved with initials, a date or a name to make it uniquely his. If dressing up for work is a must for your Valentine, these palladium finish cufflinks are a perfect gift! This classic gift can include a monogram initial for your loved one. Every time he looks down he will think of you! This entry was posted in Gifts, Holidays, Special Events on January 4, 2019 by Creative Gifts. Take a look at the calendar and you will find that the holidays are right around the corner. We all want to find the ideal gifts that say we care, cherish the person, and that we understand the receivers likes and interests. But how do you even begin to find a personal and meaningful gift? First, don’t panic! This is where Creative Gifts Direct comes into play! While there may be fleeting days left to plan, shop, and wrap, there are so many fantastic gifts out there that can be personalized on our site. Here are just a few of our favorites this holiday season. Tree Ornaments are a favorite this time of year. Who doesn’t love the smell of a freshly cut tree and the twinkle of lights adorning the branches? Give your friends, relatives, and even neighbors a gift that they can use every year on their tree. We have many styles and types, ranging from teddy bears, to stars, to hearts and angels. Choose a style that fits and then have it personalized with the year and name to make it even more special. Wine Bottle Stoppers make a perfect gift this time of year when friends and family are gathering for some good food and cocktails. After popping a little bubbLy, why not present your host with a wine stopper with their monogram or date on the top? Choose from a variety of styles including chrome plated, crystal, emerald, and clear. Some of our stoppers also double as pourers – two gifts in one! Check out the options on our website. For that special woman in your life, this beautiful jewelry tree is the perfect gift to display and organize all of her special pieces including necklaces, rings, earrings, and bracelets. Whether it is your sweetheart, a special aunt, or your amazing mom, who wouldn’t love to get this brightly silver finished tree? As an added surprise, add one of our pieces of jewelry such as a heart shaped pendant or charm bracelet to the tree to take this gift over the top! Looking for more ideas this season but don’t know where to start? Check out all of our gifts on our website and get shopping today. This entry was posted in Holidays on November 6, 2018 by Creative Gifts. The smell of the turkey cooking, the crisp autumn air, and the sounds of family friends gathering. It’s hard to believe that the big day is just a few weeks away. Over the next days, weeks, and months, Thanksgiving hosts/hostesses will begin to prepare for the big meal by making the guest list, shopping for ingredients, making the pie crusts, and prepping the table. It takes a lot of work to pull of the perfect Thanksgiving feast, so treat your host to a gift they can use on their table, during appetizers, or for drinks or dessert. Here are a few ideas to add to the blessings this November 22, 2018. This Cheese Dome with Rubberwood Board is a great way to start the day off with a cheese course. 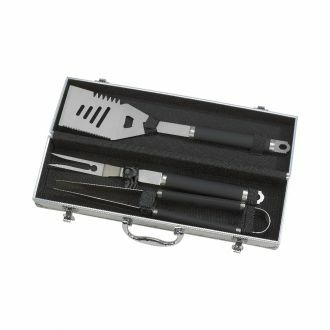 This set includes a 14.25-inch long rubberwood board, 3 stainless steel utensils with rubberwood handles, and a clear glass dome. The reverse side of the wood board also has a recessed area for the glass dome so you can remove the utensils and the dome from the front of the board. This unique set can be used year after year and will be a wonderful host/hostess gift. These Rolled Edge Napkin Rings are an excellent gift that can be displayed on the feast table. This set of 4 napkin rings feature a non-tarnishing finish for year of service and a timeless, classic design. Each 1.5-inch diameter ring has two rolled edges, top and bottom, plus ample space between those edges for personalization if you choose. Engrave names of guests or the initials of the host family to make it personal. Who doesn’t love dessert? That is, if you left room after the turkey and all the fixin’s. This set of 6 mini dessert cups with adorable bent spoons that hug the rim are perfect for grandma’s apple crisp or some homemade ice cream. Indulge in some Thanksgiving desserts with these beautifully crafted dessert cups. After a filling meal and great company, there is nothing better than sitting back and watching the football game with good company. This seven-piece tasting rack and glasses are a perfect way to unwind after the day. The wooden holder has a handle and 6 circular indents in the wood for the cups to sit in securely, both functional and fabulous. Get ready to enjoy a wonderful Thanksgiving Day with friends and family. Don’t forget the host(ess) gift. From our family here at Creative Gifts Direct to yours, have a safe and happy Thanksgiving. This entry was posted in Holidays on September 12, 2018 by Creative Gifts.